My Facebook feed has been blowing up with photos of my friends' children who are having their First Communion. I remember that LONG ago day when I had my own. Surrounded by family, it was a special day. At school, we had rehearsed and studied in preparation. At home, my mom and I shopped for a special dress and looked for just the right shoes. Although my school gave me a rosary, it was the one that my 'Buelita gave me that I still cherish today. So when Avril O'Reilly reached out to me and shared her books, I thought it might possibly be a good gift idea for some of you. 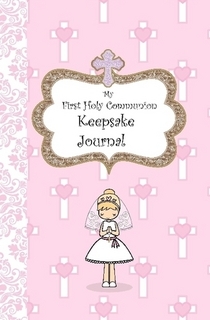 My First Holy Communion Keepsake Journal would make a lovely regalito for a young girl about to experience (or who has recently experienced) her first communion. Avril published this little keepsake journal through Lulu, a self-publishing company. The book is sweetly illustrated and contains lots of activity pages to help your child record her favorite memories. There are pages to color, draw, and write. There's even a spot where your child can add photos from that special day. I did find the font choice a little difficult to read, but it was likely chosen for its "cutesy" feel. 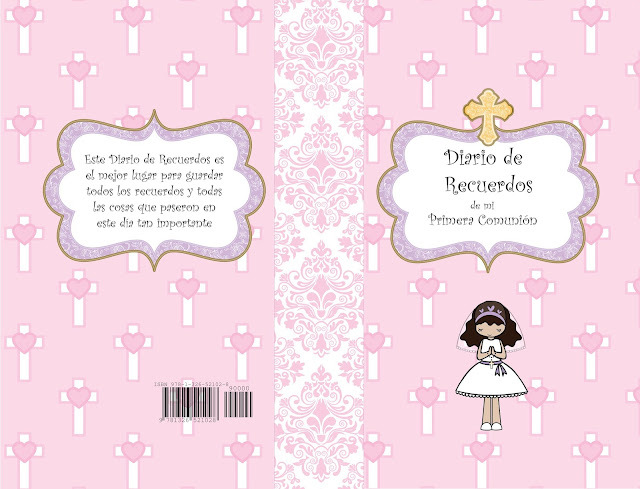 This particular book is available in two version: one in English and the other in Spanish. Este Diario de recuerdos de tu Primera Comunión es el mejor lugar para guardar todos los recuerdos y todas las cosas que pasaron en este día tan importante para ti. En el día de tu primera comunión te unes a Jesús de una manera especial y querrás recordar todo acerca del día en que recibiste por primera vez el sacramento de la Santa Comunión. Un libro es un lugar genial para guardar seguros tus recuerdos. ¡Lo más bonito de este libro es que es creado por TI! Tú llenas los espacios en blanco y añades tus propias imágenes y palabras para crear un libro de recuerdos personales de tu primera comunión. Consigue algunos lápices de colores y tal vez un poco de brillo y diviértete llenando tu libro. No hay prisa. Tómate tu tiempo y disfrútalo. Yes, this book was created for little girls. Now, from what I can see, Avril has another book that is geared more for boys called My First Holy Communion Keepsake Activity Book, but it appears to only be available in English.